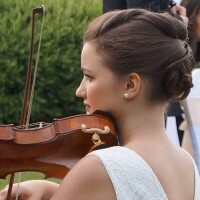 Alexandra Ruisz (b.1995) started to play the violin in early childhood. Thanks to her outstanding musical skills, she won a bronze medal at a prestigious national violin contest when she was nine. This immediately led to her first public performance with an orchestra conducted by the widely renowned Hungarian conductor, Ádám Medveczky. Following numerous other successful competitions, she was enrolled in the special junior school of Liszt Academy Budapest, established for the nurturing of highly gifted young musicians. She is currently enrolled in the regular BA programme of Liszt Academy under Prof. Környei. She loves playing the works of classical and romantic composers. Her musical sensitivity, velvety sound and emotional play have been praised by music critics. 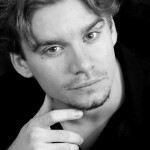 Gergő Teleki was born in 1986 in Dunaföldvár, Hungary. At the age of five, he was performing in local concert halls. Gergő was recognized as a child prodigy. Six years later, he was admitted to the Young Talent Class at Franz Liszt Academy in Budapest where he studied with Esztó Zsuzsanna and László Baranyay. At the age of thirteen, he played Beethoven’s Piano Concerto in C major at the Academy. Gergő was awarded numerous national and international prizes in Balassagyarmat, Sibiu, Ingolstadt, Kitzingen, Enschede, Gorizia and Marienbad in the Czech Republic. He has given concerts throughout Europe, including: Budapest, Pécs, Rome, Graz, Vienna, The Hague, Augsburg, Nuremberg, Stockholm, Gothenburg and Brussels.